Pablo Rolandi from Amgen delivered a keynote presentation at the COMSOL Conference 2017 Boston. The topic? How Amgen is moving beyond modeling and simulation for biopharma development. Rolandi shared five examples that illustrate this idea across both biologic and synthetic medicine applications. If you missed his presentation, you can watch a recording of the video and read the highlights of what he discussed here. Rolandi began his keynote talk by explaining that there is diversity in the biopharma industry when it comes to what Amgen is modeling. Their projects have both breadth and depth, which can require advanced modeling of biological systems. Rolandi said that one of his team’s goals is to move “beyond” simulation through the development and deployment of modeling apps. Pablo Rolandi divided his keynote talk into Amgen’s biologic and synthetic medicine projects. The first synthetics application he discussed was an agitated dryer filter (ADF). This filter helps avoid bottlenecks in the drying stage of drug manufacturing by performing three key isolation steps (instead of five, like earlier methods). Amgen researchers used simulation to determine pressure, temperature, and agitation operating conditions at the manufacturing site. They also built a simulation app so that other team members could evaluate quantitatively the difference between an ADF with a heating plate only and an ADF with a heating plate and added agitation. Next, Rolandi discussed an ethylene oxide sterilization simulation model, which, at Amgen, they call ETHOSS. The background of this model was that a novel container used for vial sterilization did not comply with standards, so the team built a simulation app to test parameters for the transport diffusion process of ethylene oxide. They found concentration and time profiles as well as numerical values for point concentrations, speeding up the development of ETHOSS by months due to the avoidance of uninformative experiments. 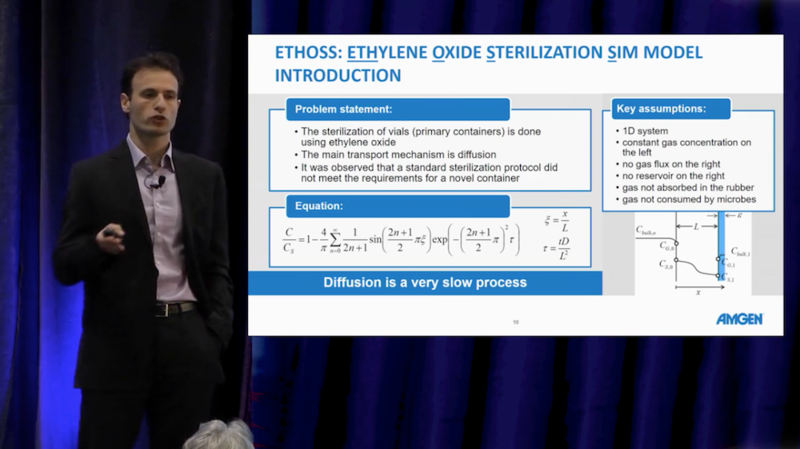 From the video: Pablo Rolandi discusses ETHOSS, a model used to study vial sterilization processes. The third application featured in the presentation dealt with the purification of biologic via a polishing cation exchange chromatography step. This unit operation is used in the biopharma industry to separate drug substances from materials that cause side effects, but simulating this process requires estimating many material properties and transport/isotherm parameters. Amgen built, calibrated, and validated a chromatography model before turning it into an app that end users could use to test the various design parameters. Rolandi shifted gears to talk about simulation for Amgen’s combination product (i.e., drug and device) applications. First, he showed the crowd a plunger position model, nicknamed PIT. By building a simulation app and deploying it, team members across the organization were able to estimate process capability metrics of plunger position manufacturing operations to meet quality requirements. The final model Rolandi discussed was a component injection time model, nicknamed KIT. In the biopharma field, the injection time for a drug delivery system must be precise, but factors like the container, drug product, and injector device cause variance. Amgen ran a global sensitivity analysis, or “factor analysis”, on the system’s parameters; e.g., viscosity, equilibrium length, and needle radius. They found that only the parameters for the needle and spring affected the results, simplifying the problem. 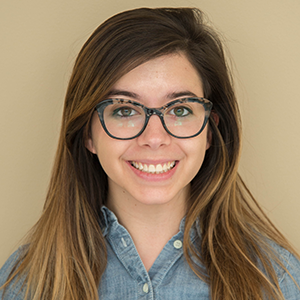 Amgen built a KIT simulation app for team members to run uncertainty and sensitivity analyses using their own combination product parameters. By creating simulation apps like the five examples featured in Rolandi’s keynote presentation and deploying them organization-wide via the COMSOL Server™ product, Amgen has been able to move “beyond” simulation. Rolandi even said that at Amgen, they think of the COMSOL® software as their “compute kernel” and aim to find a way for everyone there to access the wealth of the simulation data they are producing. By moving beyond simulation with apps, Rolandi sees both new challenges and new opportunities. To learn more about how Pablo Rolandi and Amgen use multiphysics modeling and simulation apps in biopharma applications, watch the video at the top of this post.